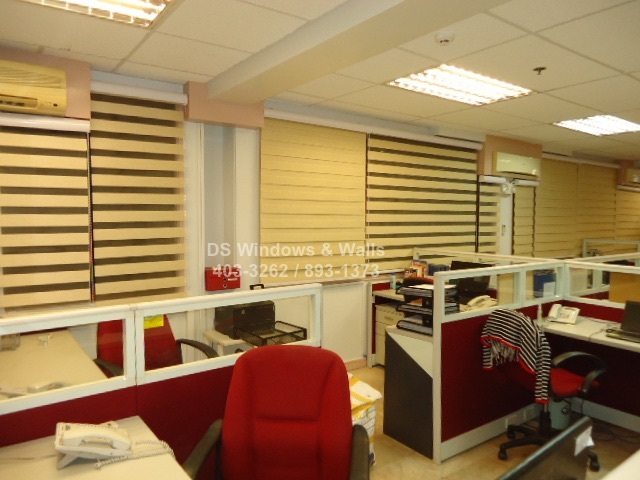 Today’s featured client from BGC Fort Bonifacio, Philippines is about office window blinds new trends and style. Looking back at circa 2000-2005, most offices from all kinds of industries use PVC vertical blinds. You may be able to remember if you are observant that 10 years ago most banks have PVC vertical blinds or even venetian blinds (aka mini-blinds) for their tall window glasses. The reason this is the case is because the trends and style before is that you use curtains for residential and blinds for offices at least in the Philippines. Thanks to the innovation and current manufacturing techniques, blinds and shades are not limited anymore to horizontal or vertical blinds styles. Come 2006-2010, roller blinds or shades have evolved and the market is quick to appreciate its advantages and straight-forward way of use. Unlike the vertical and horizontal blinds that uses a stick to tilt the blades and a separate chain to pull-up the blinds, roller blinds just uses a single chain to open and close the blinds. At this point, blinds is not considered an “office-only” window covering but its appeal penetrated also the residential consumers impressed by its simplicity. Circa 2011 up to the present, a new breed of window covering entered the market ie. 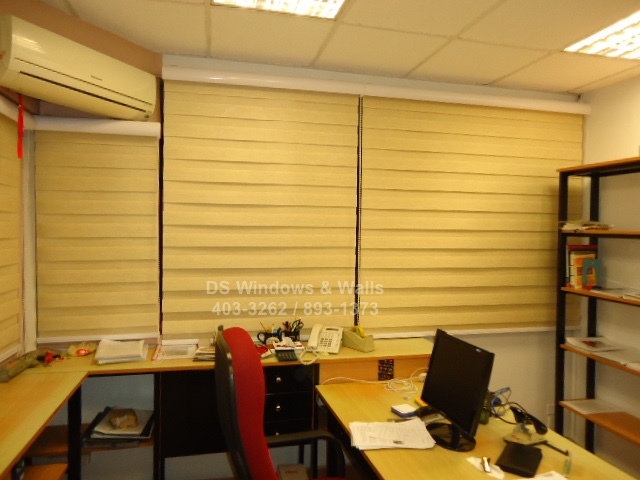 the combi blinds or shades, also known as the duo shades or zebra blinds. These type of window covering is a true hybrid of blinds and curtains because it displays the horizontal orientation of the blinds and the fabric character of curtains. As time goes by, the gap between what is proper window covering for office and what is for residential is not clear anymore. The reason combi blinds and roller blinds are adapted most home and office owners is because of its easy-to-maintain quality. This is in contrary to curtains wherein you need to bring it to the laundry every couple of weeks or so. Combi blinds fabrics are special types that can easily repel dirt and odor especially if it is cleaned by a wet damp cloth once in a while. 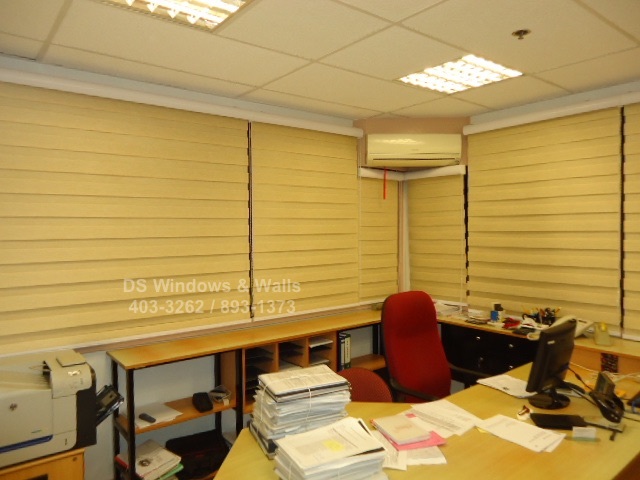 Our client opted for beige color combi blinds that they partnered with fabric maroon color office partition. It beautifully match with each other especially that their lighting has some warm effects. There’s a lot of combi blinds and shades available so to know more you may visit our mall store branches or call us at (02) 403-3262, (02) 893-1373, (02) 668-9668, or 0916-311-3909 or email us at inquiry@dswindows.com. We offer free measurement if you’re within Metro Manila. If you are in Batangas area, Laguna, or Cavite, you may also call Patrick Villapando at (Globe) 0917-583-0214 or (Sun) 0922-592-6111 or 0908-989-4676.